Today there is widespread international media attention concerning the centenary of the Titanic launch, which occurred this day 100 years ago at Belfast shipping harbour. April of 1912 is when the ill-fated voyage occurred when no doubt further commemorations will happen. 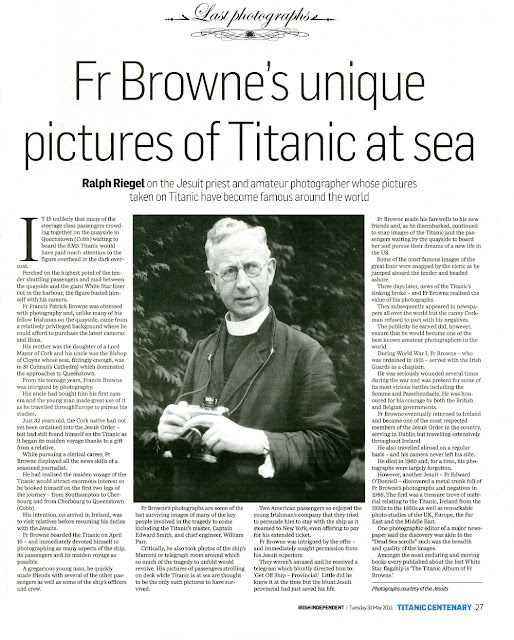 Below is an excellent article by Ralph Riegel about Fr Browne in today's Irish Independent. Note how the portrait depicts him with the hanky wedged up his sleeve - an endearing image! I'm loving the hanky up his sleeve!